Dr. Joanna Queen grew up in The Woodlands and received her undergraduate degree from The University of Texas at Austin. She then returned to the Houston area for medical school at The University of Texas Health Science Center, McGovern Medical School. 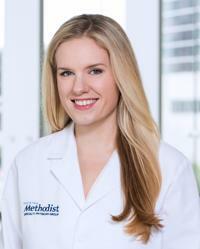 After an internship at Houston Methodist Hospital she completed her ophthalmology residency at The University of Texas Health Science Center. Following residency, Dr. Queen completed an additional year of fellowship training in glaucoma at The University of Michigan’s prestigious Kellogg Eye Center. There she advanced her abilities in the medical and surgical management of glaucoma, including minimally invasive glaucoma surgery (MIGS), as well as complex cataract and anterior eye segment surgery. Dr. Queen is a member of the American Academy of Ophthalmology and The American Glaucoma Society. Her particular research interests lie in detection and management of complex narrow-angle glaucoma variants and long-term success of glaucoma filtering surgery. She has published articles on these subjects and others in peer-reviewed journals and been selected to present research at national ophthalmologic meetings. Outside of the office Dr. Queen enjoys cooking, watching BBC period dramas and exploring Houston’s ever-growing restaurant scene. She lives in town with her husband, Daniel, and their daughter, Helen.